They say bigger is always better. But with camera lenses and wildlife that is not always true. 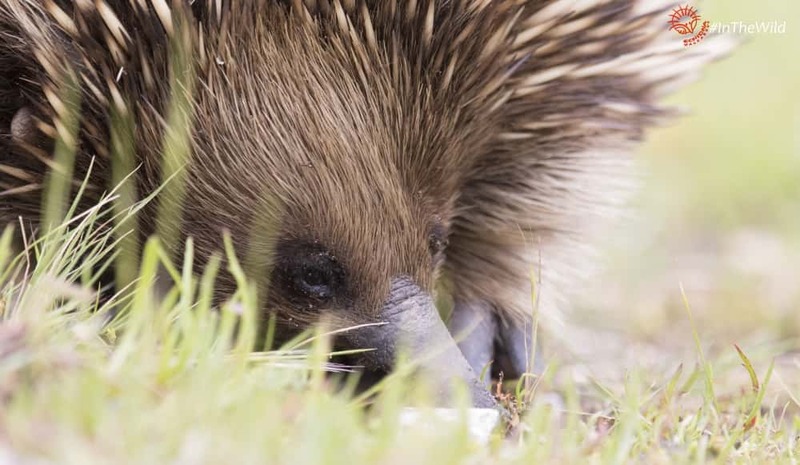 On a Wildlife Journey in East Gippsland, Wildlife Guide Roger spotted a Short-beaked Echidna beside the road. With great excitement, but very quietly, guests and guide piled out of the vehicle to watch the little animal from a respectful distance. Echidnas can be either an unmoving pile of spines, or a adorable, brown-eyed waddler – it all depends on your approach. If you’re noisy, fast-moving and erratic you’ll get the pile of spines. Echidnas have poor eyesight, and loud noise and bustle makes them bury themselves nervously. If you’re quiet, calm and patient you’ll see something marvellous. Roger and his guests watched the echidna, who moved back and forth unconcernedly. Echidnas forage at the ground surface, waddling along slowly, sweeping their pointed snout across the ground like a metal detector. Electrical sensors in their snout pick up impulses from buried invertebrates. When they receive data, they poke into holes and under rocks in search of their prey. 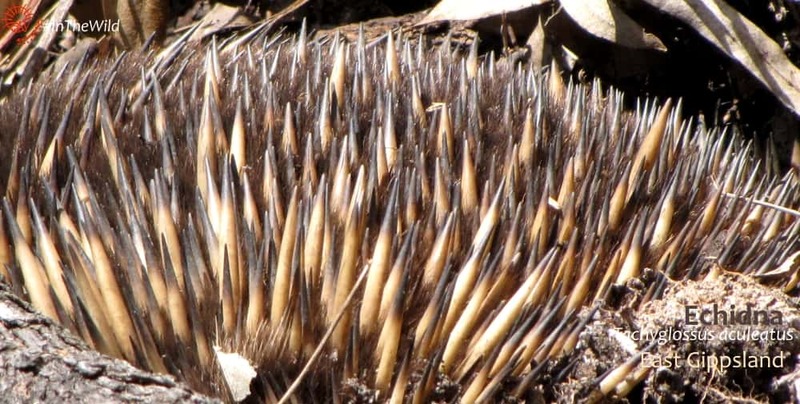 Echidna legs are short and chubby, with big feet and huge digging claws for excavating soil. Read about Echidnas odd back feet and digging action here. Guest John‘s huge camera lens was working overtime, snapping framed images of the echidna in its habitat. The echidna started walking towards the group. Through the lens, the echidna up close filled the screen. Very rarely, an echidna will be so consumed by its food search that it will closely approach a quiet, still human. The echidna came closer. The camera snapped an echidna face close-up, then a few spines. John put aside his camera. It was just too big for the job. 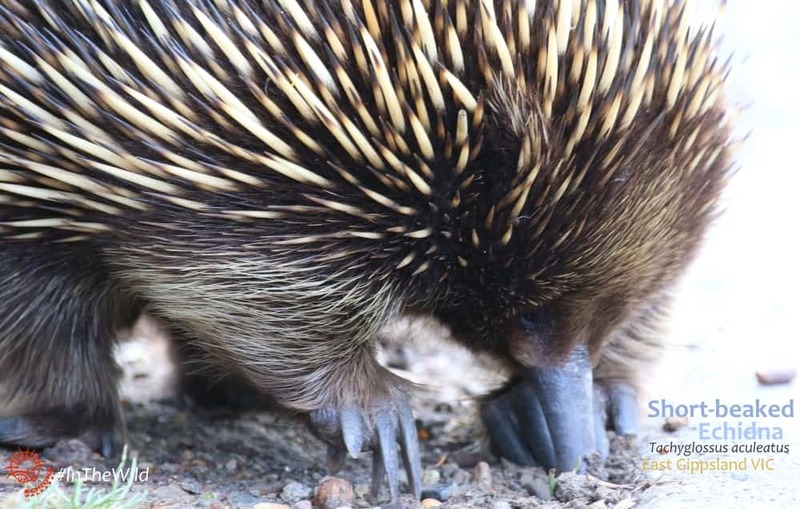 The echidna nosed around John‘s feet for a few minutes, nudging his shoes. John stayed completely still, just watching and enjoying. When the echidna waddled off, it left behind one happy photographer with some memories that couldn’t be captured on film. 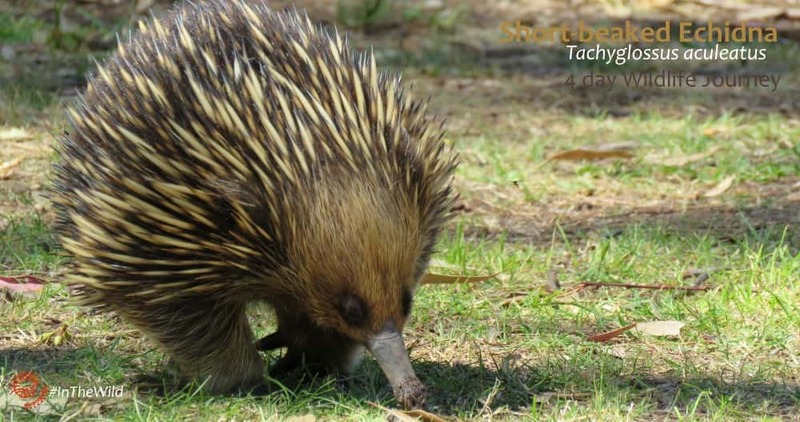 The Wildlife Journey 4 day tour to East Gippsland has a very high likelihood of seeing echidnas. The tour runs every Sunday from September to May, and is part of our 15 day Desert, Coast & Rainforest Maximum Wildlife tour.